Disclaimer: I loved UOB One, but nothing riles me up faster than a badly marketed financial product (okay fine, a badly marketed financial product through lifestyle influencers who mislead their followers for the monetary benefit of a sponsored post come a close second). And because a lot of people have been asking me about UOB Stash, I thought I'll do a review here so folks know what you're REALLY signing up for. superior account to park your money in if you're using UOB, in my humble opinion. I'm a huge fan of high-yield saving accounts that give you more bang for your buck. In fact, I've openly talked about the various options available on this blog before, including UOB One. But hey, UOB Stash isn't one of them. I had hoped UOB (as well as social media influencers working on future UOB campaigns), would have learnt their lesson from the UOB Krisflyer saga on how NOT to market a bank product. 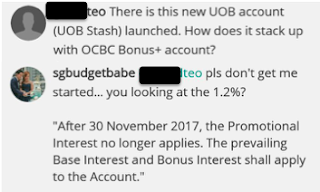 In fact, I had even offered to chat with the UOB Stash marketing team directly to share with them my thoughts on how they should manage this round of marketing in order to avoid getting flak for it as well, but was told that my offer got shot down. Oh well, maybe they know better so they don't need my inputs, I thought. 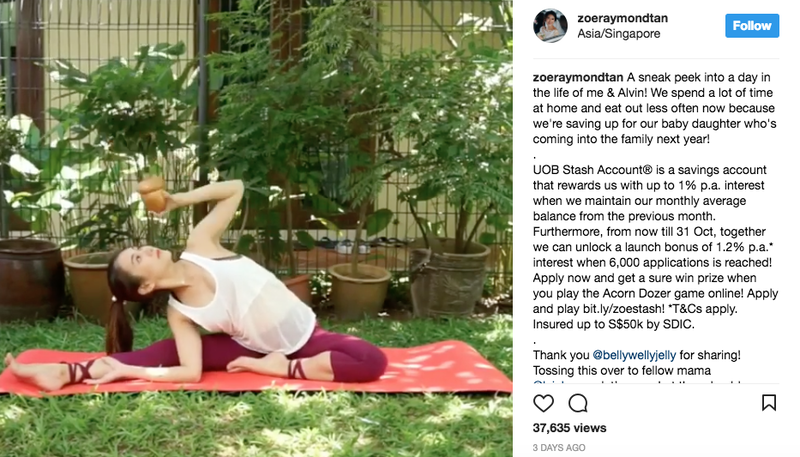 If you're still wondering what on earth happened on the UOB Krisflyer saga, head over here for a quick recap: Does the UOB Krisflyer Influencers' Campaign Reek of Dishonesty? What do you think of this account? Considering most savings accounts only pay 0.05% p.a. of interest, do you think this is a good product? I get 1.2% p.a. interest right? What do you suppose that means? What does per annum mean to you? I get 1.2% in one year lah, duh. So if you put in $10,000, how much should you be getting after one year? (opens the calculator app) $120. WRONG! If my calculations are correct, you'll get slightly under $15. 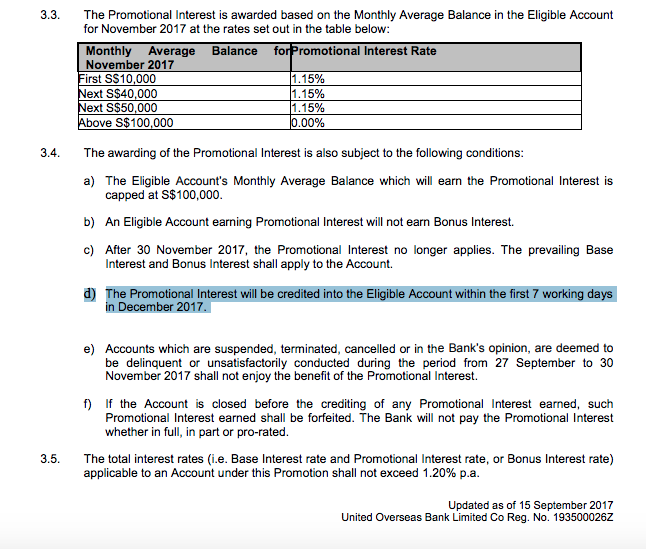 For $10k you only get 0.05% of interest for the whole year. That 1.2% that Christabel is telling you about? It lasts only for the month of November. Which means you'll be getting 0.05% for the remaining 11 months. So is the campaign misleading again? You can be the judge. Lost? You're not alone. Let me break it down. - Your first $10,000 gets 0.05%. - Your next $40,000 gets 0.8%. - You'll only get 1% on your subsequent $50,0000. And if you fall below $10,001 anytime, you can expect to get a miserly 0.05%, which is pretty much the same as your POSB Passbook saving account that you've had since you were a kid. Therefore, your effective interest rate is a lot lesser than if you had parked your money elsewhere. 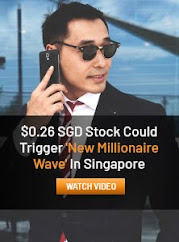 Heck, you'll even get higher interest by opening UOB One instead. After 30 November 2017, the Promotional Interest no longer applies. The prevailing Base Interest and Bonus Interest shall apply to the Account thereafter. In other words, you're NOT really getting 1.2% for the whole year, but for ONLY one month (don't ask me why it was still marketed as p.a. lah, because per annum = per year to me as well). You know that 1.2% interest that all the lifestyle influencers were hyping about this campaign? Yup, it lasts only for ONE month, which all of them conveniently left out while trying to influence you into opening an account. But wait, unlike Melissackoh who claimed she ticked Sydney off her bucket list all thanks to #Krisflyer UOB the debit card (I've no words if you genuinely believed she spent $60k just to redeem a flight to Sydney, which you can get for just $500 on Scoot LOL), I shall refrain from jumping to conclusions and assuming the remaining influencers didn't know about this point. Take a look at what they captioned instead. I was actually really confused by this post. Perhaps Leia and Lauren must be flush with cash if they're opening a UOB Stash at this age? Hey mama Amber! I've got a better lobang for you. Let's play a game of Spot The Difference! Do you see it? Eden, Roz, Nat, Amber and Zoe Raymond all said 1.2%*, but I'm wondering why Christabel was the only one who didn't put an asterisk behind the 1.2 p.a. Just like how she didn't declare the post was sponsored in the UOB Krisflyer campaign, then later quietly added the #ad hashtag after Aaron and I called them out on their bluff here. I don't know what to make of this, but it does explain why more consumers are losing faith in influencer marketing today. But is a simple * enough for you? I'll let you decide, because it isn't sufficient for me, but hey maybe my standards are just too high. Which was surprising, considering how the total views stood at over 115,000 when combined across the 6 influencers on the 24th. This equates to a sign-up rate of lower than 2% when I last checked. There were no sponsored posts that went out after 21st October, but when I checked last night (28th Oct), the bar changed to show the target of over 6,000 applications had been met! Wah, 4k applications within 4 days!?!? Incredible. Congrats guys! To the 6,091 of you who signed up, you now qualify to get $10 in November for every $10,000 you park inside the account! I sure hope none of you signed up because you really thought you would get 1% (or 1.2%) for the year. All that work for $10, and for just one month. What a joke, especially when you could have gotten about $8 every month without doing anything either if you had simply parked this $10k in CIMB FastSaver instead. I'm glad I wasn't influenced into signing up for this account. Give me UOB One over this anytime instead. Now, UOB Stash isn't necessarily a BAD product, BUT it could be good only for a few select groups of people. IF you have already maximised your high-yield savings account AND you already have CIMB FastSaver (or you're, uhh, biased against CIMB maybe) AND you have $51,000 - $100,000 of extra cash lying around doing nothing which you don't need for the next 12 months, then UOB Stash might just be suitable as its maximum effective interest rate (EIR) works out to be a fairly decent 0.83% p.a. These are very important conditions to be met. At least, that's the impression they give. The next question is, how many of their followers have $100k to spare? Take a quick look at their Instagram followers and judge for yourself. And now, because of the way it has been marketed on Instagram (1.2% p.a.!!!!! 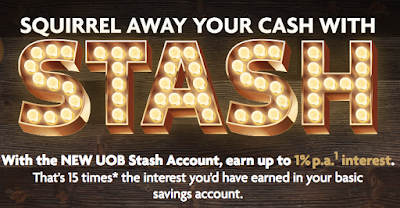 ), they've made the UOB Stash account look like a downright terrible product, when it doesn't have to be. Here's a plea from a personal finance writer: Either learn how to market it properly, or not even do it at all. No one likes feeling cheated when it comes to their money. Plus, what's the point of spending good money on influencer marketing when all it does is to make your product seem like a terrible one, and worse still, erode consumers' trust in your brand? I feel sorry for UOB, I really do. Please don't diss UOB One though, I promise it is a much better product than the Stash. Are you disappointed by now? So am I, but let me try to help. If you're looking for somewhere to park your cash, here's what I'll recommend instead. For starters, I'd recommend you look into DBS Be Your Own Boss, OCBC 360, UOB One, Bank of China SmartSaver and POSB Cashback. I've reviewed each of them at length, so you can just click to read on how to maximise the interest under each scheme. Or, if you just want a plain vanilla bank account, how about CIMB FastSaver, which gives you 1% (capped at $50k) with no frills? 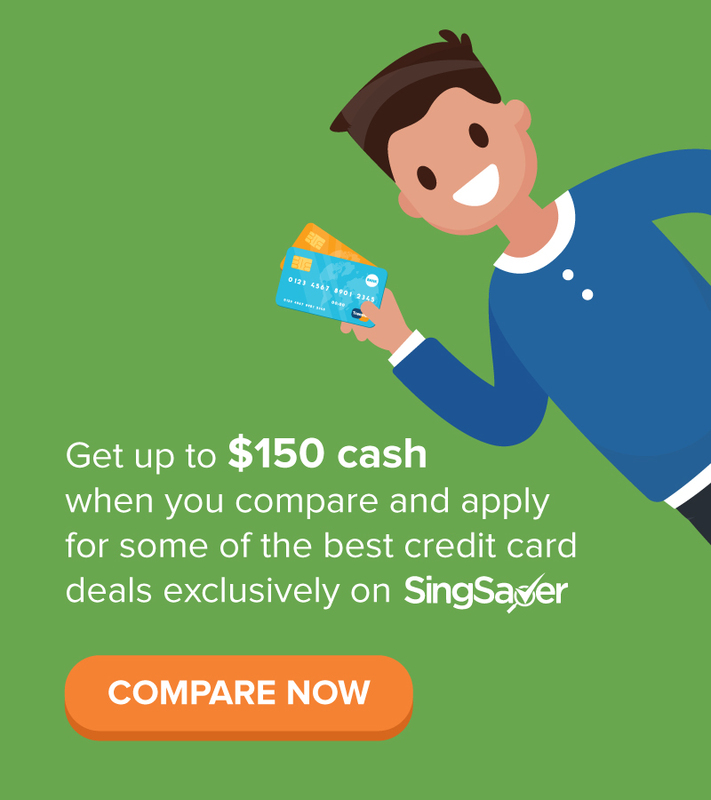 If you already have that, other options could be CIMB StarSaver (0.8% p.a.) or RHB (1% p.a. after your first $10k, please check out their tiered interest table here). If you don't need cash liquidity, try these fixed deposits instead (I compared across some really awesome ones here). You can now get short-term endowment plans from the various insurers which offer capital and interest guarantee on your monies. 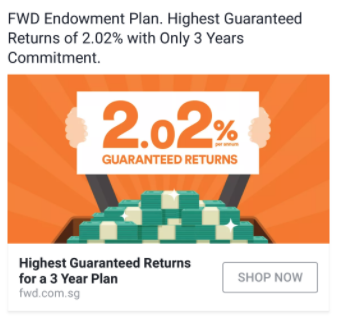 Take the FWD endowment plan for instance, which allows you to start from just $1,000 and guarantees 2.02% interest on your deposits. (To avoid exploiting the scheme, there's a cap of $15,000 per person.) This would be great for if you're looking to park your emergency funds somewhere or you're saving up for a big-ticket item in the future, as you'll need to leave it there for 3 years. You can read my review on FWD's endowment plan here. Just note that this needs to be money you don't have to use in the next 3 years, because early termination of endowment plans generally incur charges, and the same applies here. Aside from FWD, the other insurers - Great Eastern, Prudential, Etiqa, etc - have also run their endowment offerings quite recently. However, most of them have since closed, and Etiqa requires you to put in a minimum of $10k+$5k and lock it up for 6 years instead of 2. Did you get misled by the 1.2% p.a. when you saw those posts? So did I. But at least now we know better. Hey, at least it'll give you a lot more bang for your buck than UOB Stash. 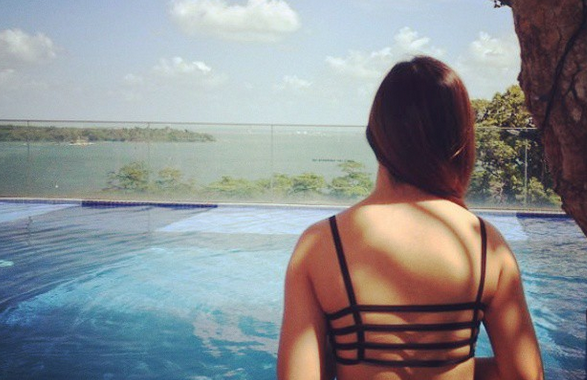 Budget Babe has a passion for helping her fellow Singaporeans get more out of their savings. No gimmicks and no marketing fluff. Oh, and always full disclosure. I don't believe in misleading my readers just because I'm paid for a sponsored post. Note: If you can't tell by now, this is NOT a sponsored post, and neither is it an ad for UOB One, although my previous review here was. 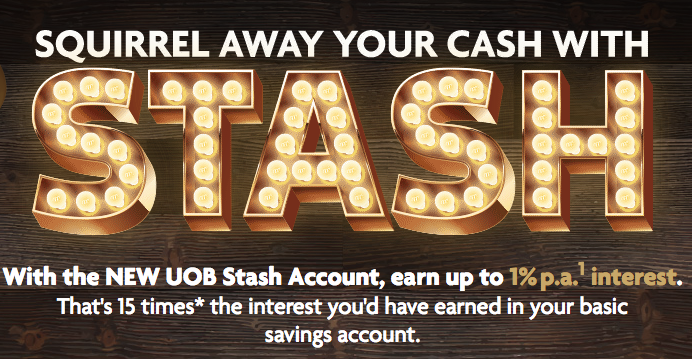 2 years on, I still think no other UOB savings account comes close to being as good. usually, i tend to avoid those that are overhyped by so-called social influencers. UOB is extremely bad at this. and thats why i dont even have any banking relationship with them. not even their uob one card/acct. btw, there is a new multiplier programe wef 1st Nov.
You're one of the savvier ones! 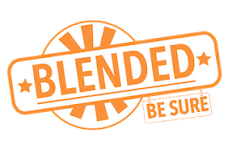 But considering the audience this campaign was targeted at, there were so many who misunderstood the 1.2% cos it was marketed on such a misleading manner. UOB's website was very clear and transparent, but not the posts on Instagram! I've gotten a few DMs already from folks asking what they should do if they've already opened an account. Still haven't replied them yet...what on earth am I supposed to say?!? Tough luck? Closing the account isn't really an option either considering you'll have to pay $30 if done in the first six months. Haiyo. Woah.. Great job Budget Babe! Need people like you to police the finance industry and prevent consumers from being misled.